On November 2, 1948, the aircraft carrier U.S.S. Leyte was operating in waters off the coast of New England. On that day, an F8F-1 Bearcat, (Bu. No. 121542), took off from the Quonset Point Naval; Air Station and landed aboard the Leyte. Later, when the pilot took off from the ship, he did so by going off the bow. Immediately after take off the Bearcat began running roughly and emitting black smoke. The aircraft lost altitude and dropped nearly to the water, but the pilot was able to recover and bring his plane up to about 1,000 feet of altitude, at which time he began to circle back toward and around the ship. (The pilot later reported that the cockpit gauges indicated that fuel and oil pressure were normal, but the cylinder head temperature was 300 degrees.) As the Bearcat was approaching the aircraft carrier from the rear, the engine lost all power and the pilot was forced to make a water landing. The Bearcat sank within 90 seconds, but the pilot was able to escape unharmed, and was rescued within minutes. The coordinates of the accident were 37 degrees, 19 north, 70 degrees, 14.5 west. The pilot was assigned to VF-71. On July 30, 1948, a pilot was returning to the Quonset Point Naval Air Station after a two hour training flight in an F8F-1 Bearcat, (Bu. No. 121566). Upon touch down the pilot applied the brakes, but the left brake overheated and locked, causing the plane to ground loop and nose over. The aircraft was damaged, but the pilot was not hurt. The pilot was assigned to VF-72. On November 22, 1949, a pilot was awaiting clearance for take off from the Quonset Point Naval Air Station. As he sat waiting in his F8F-1 Bearcat, (Bu. No. 95355), the aircraft suddenly caught fire. The pilot turned off the engine and exited the airplane unharmed, but the aircraft was damaged beyond all repair. U. S. Navy accident report date November 22, 1949. At about 11:40 a.m. on the morning of April 11, 1950, two aircraft were making landing approaches to Runway 16 at the Quonset Point Naval Air Station, and due to their approach angles, neither pilot saw the other. The first aircraft to land was a Beechcraft SNB-3, (Bu. No. 67100). The landing was normal, and after touchdown the pilot applied the brakes. Immediately afterward, an F8F-2 Bearcat, (Bu. No. 122639), landed directly behind the Beechcraft and overtook it, plowing into the rear of the aircraft. The Beechcraft was damaged beyond all repair, but its three-man crew was not injured. The Bearcat suffered front end damage, but the pilot was not injured. The Bearcat was assigned to Fighting Squadron 74, (VF-74). On August 10, 1948, a pilot took off from the Quonset Point Naval Air Station in an F8F-1 Bearcat, (Bu. No. 121657), to test the performance of the aircraft after a new carburetor had been installed. Shortly after takeoff the engine stopped and the pilot was unable to restart it. He brought the plane in for an emergency landing, but upon touchdown a tire blew out, causing the aircraft to careen into another Bearcat,( Bu. No. 121667) that was parked along the side of the runway. After the collision, the landing Bearcat rolled over and came to rest in an inverted position. The pilot wasn’t injured, but the aircraft was damaged beyond all repair. On November 30, 1948, an F8F-1B Bearcat, (Bu. No. 121470), left Quonset Point Naval Air Station bound for the Charlestown Naval Auxiliary Air Station to conduct simulated aircraft carrier practice landings. While the pilot was making his first landing attempt, the aircraft crashed and skidded 231 feet, causing the belly tank to rupture and set the plane ablaze. The pilot was able to extricate himself and suffered non-life-threatening injuries. The aircraft was consumed by fire. The aircraft was assigned to VF-173. U. S. Navy accident report dated November 30, 1948. On February 13, 1948, The aircraft carrier U.S.S. Lyete, (CV-32), was operating in the waters off Block Island conducting training exercises. On that day, aircraft from the Quonset Point Naval Air Station were sent to land on the carrier. The seas were rough, and the deck was rising and falling. One aircraft, an F8F-1 Bearcat, (Bu. No. 95112), made a “hard landing” as the deck rose as the plane descended. The aircraft was damaged beyond repair but the pilot was not injured. On the same day, a second F8F-1 Bearcat, (Bu. No. 95334) was also damaged upon landing, but the pilot was not hurt. Both of the damage aircraft were assigned to VF-7A at Quonset Point. On November 18, 1947, a group of seven F8F Bearcat fighter aircraft from the Quonset Point Naval Air Station were involved in a flight-tactics training exercise over Block Island Sound when two of the aircraft were involved in a mid-air collision. One of the aircraft was Bu. No. 95087, piloted by Lieutenant Commander Minuard F. Jennings, 32, and the other, Bu. No. 95193, was piloted by Lieutenant Commander Marshal J. Lyttle, 26. Both aircraft went down in the sea and neither pilot survived. Both men were assigned to VF-10A at Quonset Point. 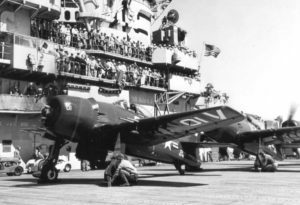 On March 5, 1946, a flight of F8F-1 Bearcats left Quonset Point Naval Air Station in Rhode Island bound for Martha’s Vineyard Naval Air Station in Massachusetts. The purpose of the flight was to practice mock carrier take-offs and landings. As one of the aircraft, (Bu. No. 94827), was making a landing, it went off the runway and into soft dirt where it flipped on its back trapping the pilot. The pilot was extricated with non-life-threatening injuries, and the aircraft suffered substantial damage. The aircraft was assigned to VF-18 at Quonset Point. U. S. Navy accident report dated March 5, 1946. On October 17, 1947, an F8F-1 Bearcat, (Bu. No. 95331), left the Quonset Naval Air Station in Rhode Island bound for Otis AFB in Falmouth, Massachusetts. As the pilot was coming into to land at Otis, the engine suddenly lost all power. Realizing he couldn’t make it to the service runway, the pilot decided to make an emergency wheels-up landing in the grass nearby. The aircraft received considerable damage as it skidded for about 600 feet before coming to rest. The pilot was not injured.